I was very satisfied with these figures. Excluding the contribution from a recent acquisition, revenue advanced 15% to £70.3m while operating profit gained 13% to £13.2m. I am pleased Thorlux once again experienced solid progress, with external revenue up 9% and profit up 6% (and up 10% and 7% respectively during H2). But it’s important to note TFW’s ‘Other companies’ — the aggregation of five of the group’s six other subsidiaries — recorded the bulk of the overall growth. External revenue here was up 37% and profit was up 102% (and up 49% and 106% respectively during H2). I think it is fair to say that these ‘Other companies’ will need to build on their recent performances to ensure TFW as a whole can deliver further double-digit expansion. TFW’s previous interim statement told me that sales of the group’s LED products had surged 80% to represent 58% of the top line. “The future is still definitely LED especially with a possible upstart contender in OLEDs or Organic LEDs apparently dropping away: it seems due to technical problems of realising sufficient efficiency in translating power consumed into useful light. Traditional light sources remain in demand and it can be reported that your company has been surprised at the level of such products requested during this summer period. I am not sure what to make of this situation. On the one hand, it suggests TFW’s older products are so good that customers continue to buy them despite the industry’s technical advances. But on the other, maintaining production of both LED and non-LED devices does lead to additional costs. For what it is worth, I am just pleased customers remain keen to order TFW products — whether these products are LED-based or not. I am glad TFW’s recent acquisition has been trading “ahead of expectation”. If you remember, TFW announced in April that it had purchased a Dutch lighting firm for approximately £9m. I said at the time the deal seemed sensible. Anyway, these results revealed the Dutch firm would have produced revenue of £10.9m and a £1.2m operating profit had it been acquired at the start of the year — in line with the performance stated at the time of purchase. TFW spent £6.4m to i) buy 65% of the Dutch firm and ii) clear £1.5m of associated net debt. The other 35% will be acquired within the next six years — and the acquisition’s trading performance so far has meant TFW has had to increase its final payout estimate by 28% (to £3.8m). TFW should have no problems paying that earn-out, what with net cash and various investments coming to almost £39m (34p per share). * Including a full-year contribution from the new Dutch subsidiary, trailing operating profits now stand at £12.4m and, taxed at a standard 20%, would produce earnings of £11.6m or 10.0p per share. * Adjusting for the group’s net cash, investments and that acquisition earn-out, I make TFW’s enterprise value (EV) to be £185m or 160p per share with the present £220m market cap and 190p share price. * Dividing that 160p EV figure by my 10.0p earnings guess, I arrive at a P/E of 16. That multiple does not look an obvious bargain to me — although it could be considered quite fair if TFW continues to report double-digit profit advances. 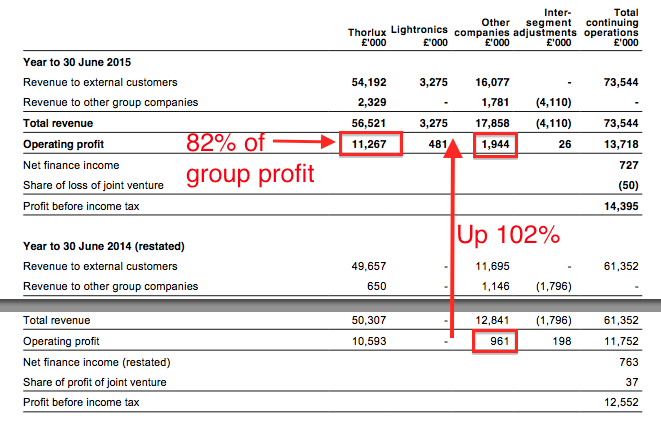 Meanwhile, the trailing 3.65p per share dividend pays a mean 1.9% income. * Full-page picture: Uh oh — page 2 contains a full-page picture of the chairman. Anecdotally such large vanity pictures can be a sign of management hubris. Revenue per staff member for 2015 was thus £139k, up from £115k-£120k seen during the previous four years and up from c£85k back in 2006. I am also impressed staff costs as a proportion of revenue has been kept in a tight 28%-30% range for the last ten years. Overall, it seems to me that over the past decade, TFW has shifted to higher-value staff, which I feel may help the firm’s competitive position. This is reflected by the average staff cost, which is now almost £40k — and up from £25k ten years ago. “The last financial year, being the subject of this meeting, provided a satisfactory and somewhat pleasing result. A financial commentator has recently reflected on a statement I had made in 2008, commenting that our Group, with its diverse market types and numerous specialised lighting sectors, benefitted from an inherent smoothing effect on “the sum of the whole”. I mention this now as currently we see a mild softening in some of our markets with others faring well. Sounds alright, but a “mild softening” in some markets does open the door a little for growth to moderate during 2016. We’ll see. He should have taken that cake. Just thought I would confirm that I have sold 25% of my TFW holding during February and March at 234.5p including all costs. The top-slicing was on valuation grounds — essentially I think the shares are ‘up with events’ right now. At 234.5p, I reckon TFW’s trailing P/E adjusted for the cash hoard is about 20. 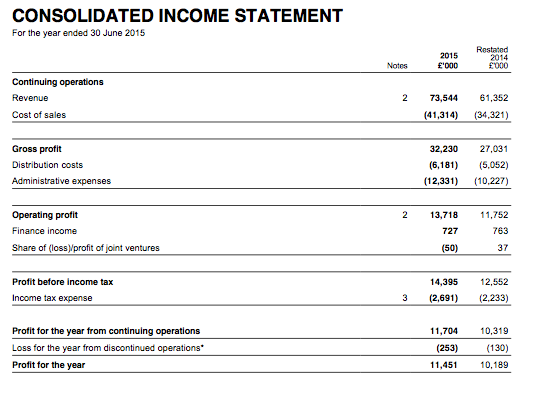 While the results covered within the Blog post above showed commendable double-digit progress, TFW’s business has not always advanced at such a pace and I note the AGM statement (in the Comment above) confessed to a “mild softening in some of our markets“. I must admit it is a shame selling TFW shares, as the company is one of the few conservatively run family firms in the stock market. But the selling does create some extra cash in my portfolio, leaving me ready to bag bargains elsewhere. And you never know, I may one day be able to buy back those TFW shares at a much more attractive valuation.